In this privacy statement references to “we”, “us” and “our” are to Patricia Weston References to “our Website” or “the Website” are to patriciawestonpsychicwitch.com. 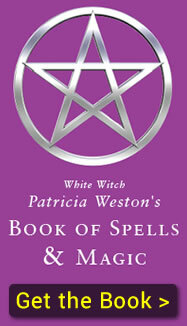 “You” refers to any user of this website patriciawestonpsychicwitch.com . Any other websites which may be linked to by our website, or may link to our website are subject to their own privacy statement and policy, which may differ from ours. If you choose to contact me by clicking an email address link, you will be sending me your personal data. You should never send sensitive personal data like credit card or bank details by email. Only I have access to data sent to me by email. Data submitted will only be used by me to answer your query or provide you with a service as requested. I will never sell, distribute or lease any personal data unless I first have your permission or I am required by law to do so. I only keep your personal data for as long as needed: so that I can answer your queries and/or so that I can provide you with a service and/or I am required to do so by law and/or you have agreed to receive marketing materials from me.